I just love the gift-giving time of year! I work really hard to find thoughtful gifts that will delight my family and friends. Sometimes, though, I struggle. I especially love giving gifts that are not only fun, but are also useful, and help fill a need. Happy shopping! Be sure to leave yourself some hot cocoa and bon bon time as you're rushing about! 2. Jar Opener - We bought this handy little gadget for my mom last year. At first she thought it was a silly thing...until she used it. Now, it is one of her FAVORITE helpful tools in her kitchen. This gift wonderful for those that don't have as strong a grip anymore. 3. Steam Mop - Woo hoo! I do believe Santa has a Shark Steam Mop under my tree this year!! I am proud to say that I actually wore out my last one. This time, I am going to use only distilled water in mine--I think our mineral-rich well water clogged the steamer over time. 5. New Perfume - I know it sounds strange, but I still wear the same perfume that I wore in high school. I figure when you find a good thing, why change? This is a luxury gift that I always appreciate receiving. 6. 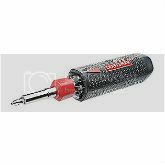 Craftsman Multi-Bit Screwdriver - Pure brilliance in a screwdriver--every bit you need is right there--and built-in! A friend of mine has this $20 all-in-one tool, and the minute I first saw it, I went straight to Sears.com and ordered 3 of them for gifts this Christmas. SHHH! Don't tell! This tool is cool, cool, cool. 7. New Pajamas - This is something I typically don't splurge on for myself. By the time I've bought all the necessities for 2 growing girls at our house, I don't always feel like I have money left over to buy myself new pj's. 9. Salon Shampoo and Conditioner - Another luxury I don't always splurge on for myself. 10. Favorite School Hoodie Sweatshirt (Go Hogs!) - A good pullover hoodie is like a old friend...without the good gossip, of course. 11. New Socks - I know this seems silly, but I love getting fun socks! Either whimsical ones, or cushy new running socks--a new sock makes my toes smile. 12. Interesting Books - Always! If you absolutely don't know which book to buy, an Amazon gift card is always a beloved gift. But, there's just something special about receiving a book someone else loved and wanted to share. 13. Devotional Book - I got this little devotional book last year because my cousin wrote a couple of the devotions (Hi, Rachel!! ), and it has been one of my favorite, and most meaningful things this year. All right--your turn! What are some of YOUR favorite practical gifts to receive? But, how could someone improve on a good and dark chocolate brownie, you ask? How about a brownie that has that tiniest bit of lovely crunch on the top, and is chewy and dark with little chunks of chocolate hidden in the middle? YES, PLEASE! And how about a brownie that you don't have to cut out of a pan? I mean--having to find a spatula, and then having to cut a brownie square, and then having to find a plate and a fork...Oh my--that's just SO much work! OH, NO!!! Who wants to WORK at eating a brownie, when (*chipper chord*) you could just lift a lighter-than-air brownie cookie to your eager mouth? Ah, but have I GOT A DEAL FOR YOU!!! Forget pans of brownies cluttering up your countertops! No more frantic searches for spatulas and knives! No more fist fights over who gets the special crispy corner brownies! Because NOW you can CHANGE YOUR LIFE with ONE SIMPLE RECIPE!!!! I present to you: BROWNIE COOKIES!!!! Beat butter and white and brown sugars until smooth. Beat in eggs, one at a time, and vanilla extract. Combine flour, cocoa powder, baking soda, and salt in a separate bowl, and stir into butter mixture until just incorporated. Drop a spoonful of dough 2 inches apart onto ungreased baking sheet, and then eat a bite of dough. Repeat, until either dough is gone, or you have a stomach ache. Bake in preheated oven until edges of cookies are just done--and the tops are just set, about 10-12 minutes. DO NOT over-bake these cookies. That would be a SIN! The allure of these cookies are their lightly crisp outsides, and rich and gooey middles. Let the cookies cool on the pan for a couple of minutes before removing. Remove cookies from pan, and then HIDE THEM FROM YOUR FAMILY!!! All right, all right. I'm done chattering on about these cookies. But, I did want to share a fun recipe with you this Thanksgiving week! I'm SO looking forward to a week with family and yummy food and giggles and beautiful weather. Welcome to the 40 Club, Little Sister! Share embarrassing pictures of her as a baby! Okay, I'm only kidding about the swimsuit part. I fear paybacks too much to risk that! So, please indulge me a little today. This is my Sissy we're talking about. And I have loved her with all my heart for...well, for 40 years now!! I have to tell ya--Ginny (left) was an ADORABLE baby and little girl! We all called her the "Gerber baby" back then. I mean--look at those cheeks!! She's still adorable now...only she won't let me pinch her wittle cheeks anymore. Mean. Seriously. Could she be ANY cuter? These pictures just make me smile. She has always been my very best friend. I loved her back then, and I love her now. Ah, what would a good Southern girl's Easter picture be...without a little chiffon and some azaleas? And what would junior high and high school be...without hair products? There are some serious bi-level haircuts here. And also--oh, how I miss the days of denim and chambray and braided leather belts. Well, I can't let my brother get off the hook with embarrassing pictures, now could I? I mean--he WAS (and IS) the older brother who picked on us relentlessly. Although, I must say that he was always sweeter to Ginny than to me. That might have had something to do with her being nicer to him! And also cleaning his room for free. I think we should call this picture: Bangs and Eyebrows. Oh, and also maybe...Matching Wind Suits. Speaking of eyebrows, I'm not going to let my brother-in-law off the hook, now am I??? The very first time Ginny brought John home to meet everyone, I found funny pictures of Ginny growing up--and placed them all around the family room. Ginny was so mad at me, and was rushing around trying to hide the pictures. But, I have to say--her future husband sure thought it was funny! I'd like to entitle this next picture: The Skinniest Any Of Us Will Probably Ever Be. This was when my whole family went to Maui. We would have gone to England...except a certain someone said, "WHAT WOULD I DO IN ANG-LUND??? Before I finish embarrassing my Sissy, I should show you her DARLING kids. Love 'em. So, happy birthday, Sissy!!!! You are one of the BEST GIFTS God has given me. I love ya like a sister. I mean--you are my sister. But, even if you weren't, I'd love ya just like one! Instead, I want to infuse this election season with some SWEETNESS. Because, what the world needs now, is dessert, sweet dessert. It's the only thing...that's there's just too little of (Amen!) No, not just for some...but for EVERYONEEEE!!! Oh,excuse me. I just got caught up in the moment. Desserts do that to me every time. Have you ever made a S'more in the microwave??? Well, I am here to tell you--15 seconds, and your life will be forever changed. Never again will I think I have to wait 270 long days until a summertime cookout--risking my very life as I toast a marshmallow on the end of a dirty stick...dangerously close to a fire, that, frankly, makes my face really really hot, and my eyes filled with smoke. Just 15 seconds, people. 15 seconds in the convenience of my very own comfortable kitchen. 15 seconds where my face isn't hot, and my clothes don't smell like I've been hanging out in the 7-11 again. 15 seconds, and I have a beautiful S'more dripping melty chocolate all over my chin, and marshmallow goo sticking to my fingers. 15 seconds in the microwave, and your marshmallow will get all puffed up and prideful. You SMASH that sucker down with your graham cracker half. Don't let him get uppity with you! WARNING: Do not eat this dessert while operating heavy machinery! What ridiculously simple dessert is YOUR favorite?